CHA Pole Barns is a full-service pole barn and post frame construction company specializing in residential, commercial, and equestrian buildings. Get a free quote on your next barn with the form below. Add a splash of color by adding wainscoting to your barn. This 36" high skirting at the base of your walls adds a two-tone look that is eye popping. For little cost, you can really enhace the appeal of your barn. Single Bubble: 1/8" Single Bubble Insulation provides an R-3 value as well as creats a vapor barrier which eliminates condensation. Double Bubble: 1/4" Single Bubble Insulation provides an R-6 value as well as creats a vapor barrier which eliminates condensation. R-10 3" Fiberglass: 3" thick vinyl-backed fiberglass metal building insulation provides an R-10 value. R-13 4" Fiberglass: 4" thick vinyl-backed fiberglass metal building insulation provides an R-13 value. R-19 6" Fiberglass: 6" thick vinyl-backed fiberglass metal building insulation provides an R-19 value. R-30 Blown Cellulose: 9" of blown cellulose insulation provides an R-30 value. This product is made of recycled papers. R-30 Blown Fiberglass: 13" of blown fiberglass insulation provides an R-30 value. This product is made of of the same fiberglass as normal batts. These breathable strips contour to the ribs of the roof to seal the gap at the top of the roof caused be the rib pattern of the metal roofing. This will aid in overall ventilation and the reduction of condensation. Be sure to add this in barns housing livestock and barns that will have a ceiling in them. Add natural light within your barn with these polycarbonate skylight panels. Available in frosted white and clear, they are positioned at the the top of the eave side walls and span the lenth of the barn. For maximum natural light, place them on both eave side walls. These classic additions are as functional as they are beautiful. Not only will they help cirulate air, but they will add a touch of class to you pole barn. We even offer an assortment of weathervanes to personalize your building at no additional cost. Grade Guard protects your posts from rotting with a 30" tough plastic "sleeve" which slips over the post just a few inches above grade. This product eliminates soil-to-wood and concrete-to-wood contact delivering post protection where it matters most. Post Protector protects your posts from rotting with a tough plastic "boot" which slips over the bottom 5' of the posts. This product eliminates soil-to-wood and concrete-to-wood contact delivering complete post protection. Add more leak and condensation protection while giving your barn even greater structural integrity by adding wood sheathing and 15# felt paper under your metal roofing. A perfect addition to barns in higher snow load areas. Snow Bars fasten to your metal roof to keep accumulated snow from avalanching off your roof causing damage to gutter, landscaping, and anything else in its way. Finish off your barn by lining the interior walls and ceiling with painted metal, OSB, or plywood. The wall liner provides protection of the exterior walls as well as a place to hang tools. The ceiling liner allows for the installation of ceiling insulation and keeps the heatdown where it belongs. With the ceiling liner panel be certain to add a 12" overhang with vented soffit, a continuous ridge vent, and a roof condensation barrier for optimal performance. Lighter, straighter, and stronger than traditional solid-sawn posts, laminated posts are fast becoming popular in pole barns. These posts utilize three to four plys of 2x6 or 2x8 lumber with the treated lumber being nearer the bottom and standard Yellow Pine being nearer the top of the posts. These boards are all glued and nailed together with state-of-the-art equipment to create the length and strength of post required for each specific barn. If you like the look of a steeper roof or need to be able shed snow more effectively, a 6/12 pitch roof is the answer. Our standard building plans are designed to meet all IBC and BOCA building codes, but some building departments demand engineer stamped building plans. If this is the case in your area, we are more than happy to have a third-party architect or engineer stamp your building plans for you. This is utilized along with the 12" overhang to allow fresh air to enter the pole barn. The perforated soffit panels aid in overall ventilation and the reduction of condensation. Be sure to add this in barns housing livestock and barns that will have a ceiling in them. As with any construction project, it's always a good idea to get an estimate first. Pole barns are no different and before you choose builder for your outdoor pole building, get a few estimates first. Like any construction task you will need to factor in material and labor costs to determine what the final cost will be. 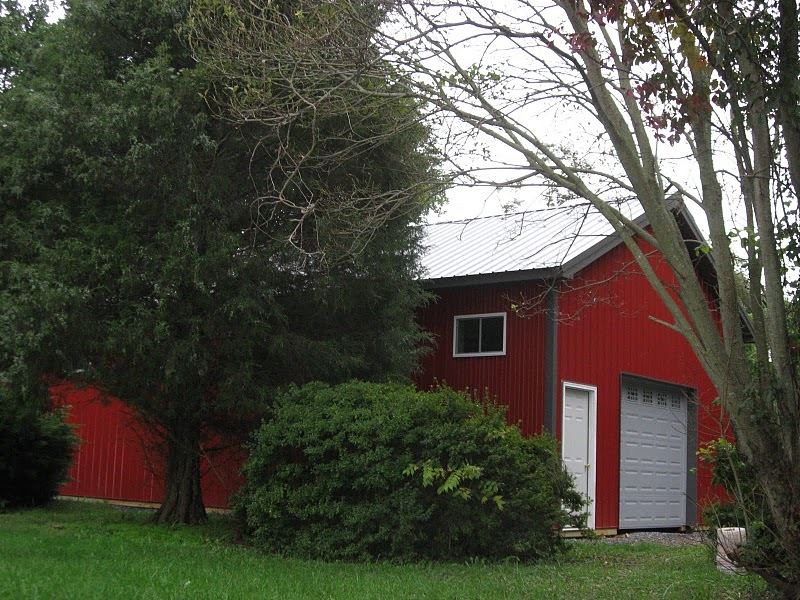 Pole barns often involve premium-grade lumber, code-compliant wood trusses and high quality metal roofing which can be found at varying prices. The price for labor will also vary depending on who you choose, the size of your building and how long it takes. Where you build your pole barn, how big it will be and the types of roofing and siding materials will help get you started on estimating the cost of the project. You should also note if you will need larger doors than average, if you plan on using overhangs and if you will feature entry doors and windows. You will also want to know if you plan on adding a porch or lean-to. Lastly, shop around for the estimated costs of time and materials so you have a good idea of how long your project will take and what you can expect in terms of costs. Again, it is recommended you get at least three quotes for a pole barn project. When shopping around ask each company you are considering if they are fully licensed and insured, how long they have been in business and if they can provide recent references. Knowing this information will help you better decide which pole barn builder is right for you.